Do you always forget when it’s necessary to be scared of getting trapped in a spiderweb? Just memorize these helpful mnemonic devices to remind yourself that it’s pretty rare! 1. Small web, go ahead. Giant web, stay in bed. There’s no need to panic yet. Then your troubles have begun. If none of these devices are doing the trick so far, try these other three below. You don’t have to live thinking that all spiderwebs pose an existential threat to you! Most do not! 5. Sally Stuck To Silk Strands Of Spectacular Size. Wendy Walked Away From Web Of Wee Width. 6. Imagine that you’re wandering through your childhood house. Visualize different amounts of spiderwebs in every room. Some rooms only have one or two small cobwebs stuck in the corners. Other rooms have thick webs covering every wall and piece of furniture. Your bedroom has the most cobwebs of all, completely filled up with dense sheets of webbing hanging floor to ceiling. Only your bedroom has a human skeleton stuck in the webs, and there are no human skeletons anywhere else in your house. 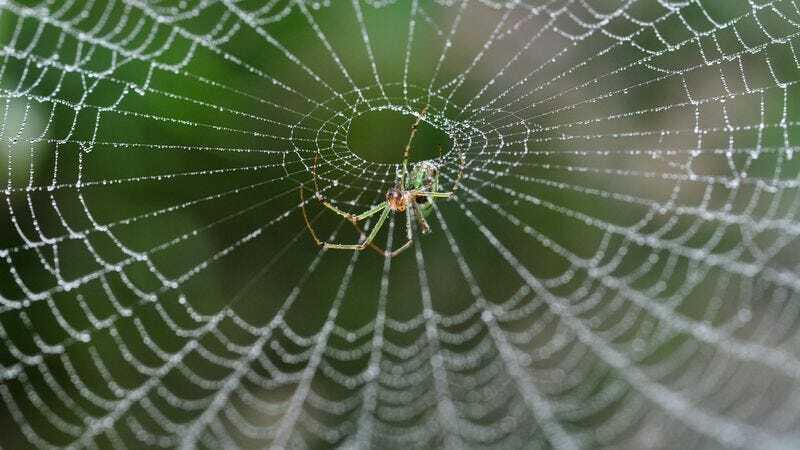 Next time you see a spiderweb, just visualize your childhood house and you’ll be fine! 7. Spiders have eight legs. The factors of 8 are 1, 2, 4, and 8. ONE thing TWO look out FOUR is a GR-EIGHT big web. There you go! You now have plenty of tricks to help you remember that the vast majority of spiderwebs are far too small to pose a danger to humans. Get ready to live your best life!